As a WAHM, your day-to-day life can easily feel out of control. The good news is that you can take back your time with one simple tool... the calendar. When you're a WAHM, your family and work lives are forever intertwined. This gives us an incredible amount of flexibility and freedom, but it can also be paralyzing. Where do you draw the line between productivity and relaxation? It can feel like there is never enough time for both, which leaves us hopelessly drained and discouraged. The good news is that we can take control with one simple tool... the calendar. Decide what type of calendar works for you. Digital calendars are convenient, but there is also something so satisfying about crossing items off a written list. I recommend Google Calendar because it's easy to use, free, and accessible from any device. Once you've created your calendar, schedule all of your family time and commitments. 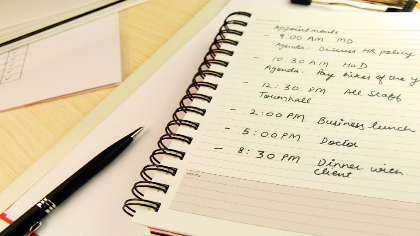 As a WAHM, your family is most likely your biggest priority, so it should be scheduled first. This is also the time to schedule everything you do for self-care (yoga class, date nights, time with friends). How we spend our time shows what we value, so make sure you clear plenty of space for who and what matters to you. This also prevents burnout. Next I'm borrowing a tip from Marie Forleo and suggesting that you make two lists for your business or job: important tasks and urgent tasks. They sound similar, but there is a big distinction. Important tasks move your career ahead, but often get overshadowed by the urgent. An important task could be working on that ebook you've wanted to publish for months, or connecting with your audience in a new way. Urgent tasks, however, feel like they have to be done immediately. Things like updating your social media or replying to emails can be big distractors and will always feel urgent. Make sure to schedule time for important tasks first, and then fill in time for the urgent. Once you have a good idea of what's truly important to you, it will be much easier to plan ahead. If you're a blogger or need to constantly create new content, challenge yourself to schedule your editorial calendar for the next 3 months, 6 months, or even a year! Keep in mind holidays, vacations, and any new products you would like to launch. And finally, while it's wonderful to have a year scheduled in advance, changes and setbacks are bound to come up, so don't beat yourself up for having to make changes. As moms, we are constantly adjusting and re-prioritizing throughout the day, so bring that same creativity to your career. I strive to look over my calendar every night and adjust the next day's schedule as needed. Good luck and happy scheduling!